I really don't know what has happened but my post yesterday seems to have vanished, after taking two hours to type up. Guess that I will have to start all over again. Not good considering the stuff I wrote, but here goes. I see that the BBC is up in the air over the vicar who said it was OK for the needy to shoplift. Well guess you are a spooky_dude crazydave when everyone looks at your 25th november 2009 email to the Metropolitan police. God I hate having to type out a blog twice, guess it has something to do with using Cardiff County Council computers, maybe. All those first time thoughts needing to be recalled, and the impossibility of that. Well lets get on with it. On the 24th November I emailed the Metropolitan Police over Mr. Michael Martin the Ex-Speaker of the house of Lords. The officer who came back to me said email your MP not knowing that my MP Julie Morgan refuses to respond to my emails. Here is my reply to that and what came before in decending order. Well bugger me I just opened up my email to copy paste the original and guess what they have sent me a reply, coincidence there are none. This is all very peculiar. I hope that you will attach it to the inquiry below, as my MP refuses to respond to emails from me regarding this matter, also given that if Mr. Michael Martin had his way and the information never came into the public domain, then certain Mp's would not have paid back what they have, and the public purse would be that little bit lighter. I wonder if the Metropolitan Police would be so easy on shoplifters, who return the goods that they have stolen, given the president of MP's and dubious expenses claims. The see your Mp made me laugh though at the time, and made me have a rant at William when I first published this yesterday. I was asking William to investigate whether it is a criminal offence for an MP to not respond to emails from constituents, and also whether the Met would investigate South Wales Police for not doing the Fraud thing with Cardiff County Councils rent revenue account. For William Martin of the Met I will ask this once again. Could they investigate the rent revenue account and ask these two questions. If the Council tenancies had been transferred out to Housing Association ownership for the ten Years prior to the Welsh Assembly making the council put rent rebates in the general fund, would that account have had any rent rebates in it? and if they were now in Housing Association ownership would there be £30 Million showing in the Councils general Fund for rent rebates? Not only that William but they also artificially raise the rent level by acting as they have for so long. Causing housing associations to have their rent levels a little bit higher but not disproportionately so, and private landlords to not look as they are charging obscene rent levels. ITS BEEN ONE BIG CON FOR YEARS WILLIAM, and South Wales Police are actively implicated, given the banner I displayed at the Welsh Assembly for far to long, and the Police Officers there doing sod all about the claim. You will see videos on youtube that confirm this. You will see Members of South Wales Police removing said banners from being displayed when the Queen came to sanction the latest Assembly because they were in direct line of sight to the national Media, when I had no previous problem displaying them on those same railings. The excuses use being were pitiful, but what rights has one individual against so many Police Officers??? The right to display art works in a public place, violated on spurious grounds, the real reasons the one above. You will find that even the new first Minister and his cabinet members are refusing to respond to freedom of information request from me, see the bio-gas blog on http://bbccrazydave.blogspot.com Which this one if it doesn't miraculously disapear again will be a part of. Seeing as this time its being typed in an internet cafe so it might actually stay there. For instance this is an email sent to Huw Lewis one of the runners in the who is to be the new first minister at the Welsh Assembly prior to the result. I heard you on BBC Radio Wales phone in today, and so I thought I would send you this link to my main blog site just in case you never did get the details of it from my banners http://bbccrazydave.blogspot.com You might wonder why several of the ideas were not incorporated into the Child Poverty strategy, I call it adult poverty but then that isn't such an emotive title. all the best, and you will see what I mean about vulnerable adults in sub-standard housing that the current First Minister has chosen to ignore along with Carwyn Jones and Edwina Hart being members of that miserable group known as The Usual Suspects. Win or lose the coming vote I hope that you will take time out to dip into the blogs view some of the videos and raise some awkward questions because funnily enough I think your heart is in the right place. Many thanks for you email.All contacts relating to Assembly and constituency business will be dealt with as normal. However, if your email is in relation to the "Lewis For Labour" campaign, could you please email lewis4labour@gmail.com or call 07910 839678. Having said all that I have as I said in opening up this blog I received James Young's reply today, I am still curious as to why my blog yesterday vanished, that is something that I am not aware has happened before, and very very suspicious I am about that. So for the record this is what I received today people regarding the Freedom of info Request. Even though the complaint is still there regarding my MP William. Is any investigation being carried out on the former speaker of the House of Commons Mr. Michael Martin and His misuse of public funds in attempting to hide the abuse of the MP's expenses by MP's from the general public? DECISION In accordance with the Act, this letter represents a Refusal Notice for this particular request under Section 17(4). (4) A public authority is not obliged to make a statement under subsection (1)(c) or (3) if, or to the extent that, the statement would involve the disclosure of information which would itself be exempt information. Section 30(3) provides Investigations and proceedings conducted by public authorities Section 40 (5)(b)(1) provides for Personal Information. Section 30 is a class based qualified exemption and consideration must be given as to whether there is a public interest in neither confirming nor denying the information exists. Harm and Public Interest Considerations with regard to Confirming or Denying that the information is held. The MPS is charged with enforcing the law, preventing and detecting crime and protecting the communities we serve and there has to be a public transparency of policing operations. The MPS share information with other partnerships and agencies as part of the investigation process. Irrespective of whether the information is or isn't held, the MPS will never confirm details that could undermine the investigation or undermine the sharing of information with other agencies. Cause problems for maintaining a confidential source. Undermine the partnership approach to investigations. Public safety and the ability to investigate without prejudice is of paramount importance and the MPS will not divulge whether information is or isn't held if to do so would place the safety of an individual at risk or undermine investigations. Therefore, at this moment in time, it is our opinion that for these issues the balancing test for disclosure is not made. No inference can be taken from this refusal that the information you have requested does or does not exist. We consider that Section 40 can be applied in this instance. As the applicant is asking for third party personal information I will need to consider whether disclosure contravenes the data protection principles and the lawful processing of data. To confirm or deny whether personal information exists under the Act, would publicly reveal information about an individual(s), breaching the right to privacy afforded to persons under the Data Protection Act 1998. However, this notice does not confirm or deny that the MPS holds the information that you have requested. Your attention is drawn to the attached sheet which details your right of complaint. Should you have any further enquiries concerning this matter, please write or contact me on telephone number 020 7230 2372 quoting the reference number above. I will not bother with the complaint prioceedure part rights here, its been enough typing all this up again. All I will say when I return this to William Martin is 'will he investigate the complaints that do exist in this blog that South Wales Police refuse to??' Well William will you??? Thats it, I still find it remarkable that I can mention that my MP refuses to respond to emails, and nothing happens. Have a read through the blogs William and you will see that the Parliamentary Commissioner for Standards also refuses to respond to my emails as does the Prime Ministers office same as Mr. David Cameron et al House of Lords Members. Lately Hayley Chislett of South Wales Police and Judge Gary Hickinbottom have begun to block my emails where previously they had gotten through. A Judge who has a job as head of the Tribunal Service, that deals day to day with vulnerable adults. Well he turned his back on this one and the many hundreds of thousands that apply to them for assistance each year, who are systematically used to feather the nest of the professional elite and get a pittance themselves. Time to embed the video William and add the Carwyn Jones picture, where are you Mr. Jones why have you failed to respond to the previous blog I sent you?? Yes all the hype on the news today is of the preacher who said it was better to shoplift than to burgle or mug others or go into prostitution, pity he didn't say that its OK for MP's to rob the Treasury only to be caught out when Mr. Michael Martin's attempt at perverting the course of justice failed. Using tax payers monies to do it with. No wonder the leaders of all political parties were singing his praises and back slapping him on his route to the House of Lords. After all he'd tried to save all their naughty members from public scrutiny hadn't he. You either have to be very stupid or very naive to believe that he did not know what they all got up to with their expenses claims, him being an MP for so long n all. Or that disclosure would rile the public like it has. Time to embed the video upload the picture and see if this blog last a day. All the Best people Now lets see if the Met will act on the people of Cardiff's behalf where SWPolice have so far refused. Isn't that right PC Haines! 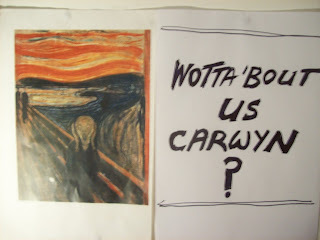 I am about ready to send this to all the Usual Suspects, not that any will reply Eh Mr. Carwyn Jones? I am still waiting on the Freedom Of Information Request for all Sewage Sites in Wales from the Bio Gas blog. Carwayn being a previous Environment minister ought to know whether there are any maps of those, and if not where to get hold of them. I doubt its anything that threatens the security of the Country but more Malfeasance in action Eh Mr. Jones? To Officer William Martin of the Met £30 million divided by 17,500 which is the amount of Tenancies Cardiff CC Like to boast that it has comes to £1,714 give or take a few pence divide that by 52 weeks of the year and and that comes to £32.96 pence a week that has been systematically swindled out of the Council Rent Revenue account per tenancy when it was logged there. What I wonder is how many years are the Council going to claim that £30 million has to written off the Rent Revenue account for depreciation, especially when the properties have been upgraded some what, in order not to show a profit in that account. You might care William to investigate the Local Government Ombudsman prejudiced handling of my claims of Criminal Negligence by Cardiff County Council my landlord. What is really odd William is that there was a note in the door today about some contractors wanting to put in free loft insulation? They know that the only person who is likely to benefit from that is Mr. Watkins, and he has bought the property off them. More fool him given the below building standard regulation sound insultation between the floor and ceiling. So the insultaion is for a private owner? I wonder how many other privately owned homes are getting free loft insultaion from Cardiff County Council. Once again I will say that 'If the Councils Tenacies had been transferred to a housing association Ten years ago their account would be up by £300 million compared to that of the Councils!' With higher standards of housing for the people of this city than the Council has been able through odd accounts practices to provide. I still call it Corporate Fraud and all Elected and Un-Elected officials have conspirerd to keep it that way. Shame on the Welsh Assembly for allowing them to do it. Shame on the Ombudsman for not demanding a set of accounts 'As If' but then corruption is rife in Politics both at Westminister and in Wales. I shall be also replying to Kevin Gales letter today, pointing him the direction of these blogs and asking him why in his 4th Dec 2009 letter to me he had to quote 3.2 of the Councils regulations? As well as his assertion that my back garden is overgrown and unkept, I think he really ought to have a look on youtube for me to refute his claim. Either Mr. Gale has no understanding of winter gardens or of my demand for laplock fencing that I have since 2002 been asking for. Unfortunately the Citizen Advise people know nothing of the Law about with-holding rent or I would be doing that this week and having the money go into a seperate account. Not that your MP or Assembly Member will give me any sage advice, given they have aided n abetted Cardiff County Council in this for oh so long Eh Crazydave? Thats right Officer, they appear more than happy for this to continue till hell freezes over to their shame. Your gonna have to go to an internet cafe now Crazydave so that you can send this update and the rest of the blog to everyone, and again to Mr. William Martin of the met, as my blogs are still being blocked on the Councils Library computers. So much for Democracy, plus I am still waiting on a reply to an email sent to the Tenants Federation pointing out the blogs, requesting an appointment to start a campaign with all 17,500 tenants of the council with-holding their rents placing them in one single account as a peaceful protest until the set of 'AS IF' accounts are produced. Which will hopefully be my next blog. Love n Light People and all the best means Decent housing for the Vulnerable where the Likes of David Cameron do very nicely with their Two Homes. I would like just one, where I am not constantly having my right to peaceful enjoyment ruined on a daily basis (Oh yes Mr. Met Officer that is still on going), due to the sub-standard housing provided in Cardiff. I never did get to send it yesterday, one thing lead to another, glad that I didn't though because the Daily Express had and article on Housing Benefit again. This time its 'The Welsfare state is broken and not fit for purpose' They have figure for expenditure £11.1bn for 1997 £14.8bn for 2006 and an estimated £20.8 bn for 2010 what the Daily Express does not mention is where the rise has occurred the most i.e. for the numb nuts what were Council Housing Benefit payments for the three years mentioned then Housing Associations and then Private Landlords if they ask the Dept of Works N pension they will have the break down figures for it. I will hazard a guess that the main growth area is in the Private Landlord sector. After all they charge the Highest Rentals. Plus given that the Buy to Let market following on from council house sales grew so much that will be where the rise comes the most. It is insanity and I feel like uploading my Nye Bevan banner or my Wiston Churchill banner to say well I told you so. They talk n talk about making the hard decisions. The Daily Express was no doubt one of those rags that blew mightily on Mrs. Thatchers right to buy, well sorry boyyos these figures are a direct result of that policy and here you are bemoaning the fact. Yep the Chickens have surely come home to roost Crazydave! Havent they just well is Central Government going to take the hard decision to compulsory purchase all Private Landlord Properties where there are long term benefit claimants in. Are they going to promote Social Housing as the real way forward. You can see from what is written here that Tenancies owned by Cardiff CC could be £32.96 a week less than they are, given their accounts are a sham. That would mean mine would be in the £40 per week region not £70 odd. But then the likes of the Daily Express would have a flying fit if government for the sake of the people did such a thing. Nationalise Housing making it cheaper for all, and tough luck to the property millionaires who are doing very nicely out of the £20bn to come their way this year if nothing is done. Isn't that right Mr. Darling. Update over time to send it at last PS I sent the first draft of this blog to the Met on the 22nd Dec 2009 so far no reply. The original of this email was scanned for viruses by the Government Secure Intranet virus scanning service supplied by Cable&Wireless in partnership with MessageLabs. (CCTM Certificate Number 2006/04/0007.) On leaving the GSi this email was certified virus free.Communications via the GSi may be automatically logged, monitored and/or recorded for legal purposes. Cafodd fersiwn gwreiddiol y neges e-bost hon ei sganio gan wasanaeth gwrthfeirysau Mewnrwyd Ddiogel y Llywodraeth (GSI) a ddarparwyd gan Cable&Wireless mewn partneriaeth â MessageLabs. (Rhif Tystysgrif CCTM 2006/04/0007). Wrth adael y GSI nid oedd unrhyw feirws yn gysylltiedig â’r neges hon.Mae’n ddigon posibl y bydd unrhyw ohebiaeth drwy’r GSI yn cael ei logio, ei monitro a/neu ei chofnodi yn awtomatig am resymau cyfreithiol. It just goes to show that his office has received them all over the last few years Officer, and never ever replied. Case of Aiding n Abetting Criminal Negligence for any fool to see Crazydave. Well you would have thought so by now wouldn't you Mr. Mark Thompson soon to be former head of the BBC me thinks. Oh and by the way of an intro to the blog I had this for the U.S.
Its the 5th jan 2010 and I understand that Mr. Carwyn Jones is meeting with the Prime Minister today. I doubt very much that any of this will be on the adgenda, but then the Media has failed to pressurise them with those Oh So Awkward question, isn't that right people. Sure is Crazydave. I only hope that these blogs of mine help to create positive change for the good of the many not the few. This is Nick Clegg's first introduction to the files 'Hi Nick its not as if 2 previous Lib Dem party leaders were not members of the Usual Suspects and they couldn't be bothered to reply either' So I guess you will remain the same. Thats all for this blog folkes!!!!!!!!!!!!!!!!!!!!!!!!!!!!!! !Change is a-comming yes indeeedy!!!!!!!!!!!!!!!!!!!!! UPDATE 9TH fEB 2010 Just thought that I should add that nothing has been heard back from the Metropolitan officer Mr. Martin as of todays date. Meaning chief constable that I am still being criminally neglected.